Destruction of habitat is the biggest threat to the current population. Logging continues even in national parks should be protected. Recorded 66 tigers were killed between 1998 and 2000. Sumatran tigers are the smallest tiger subspecies. Sumatran tiger has the darkest color among all the other tiger subspecies, the black pattern width and the distance is sometimes attached tightly. Sumatran tiger males have an average length of 92 inches from head to tail, or about 250cm long from head to toe with the weight of 300 pounds, or about 140kg, while the height of an adult male can reach 60cm. Females have an average length of 78 inches or about 198cm and weigh 200 pounds or about 91kg. 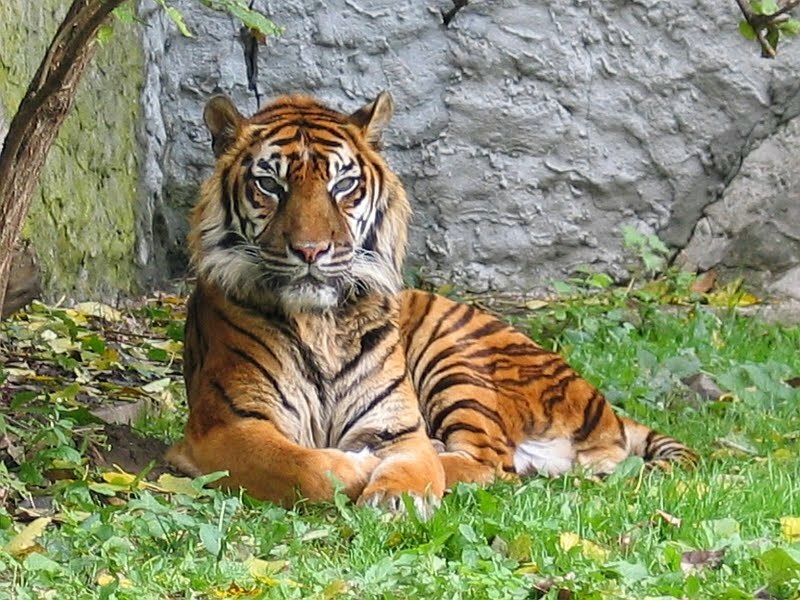 Sumatran tiger stripes are thinner than other tiger subspecies. 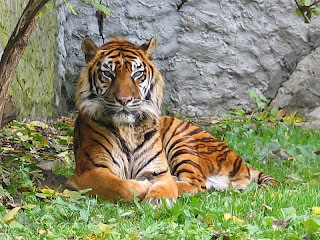 Sumatran tiger skin color is the darkest of the tigers, ranging from yellow to reddish orange old. This subspecies also had more beard and mane than other subspecies, especially the male tiger. Its small size makes it easier to move through the jungle. There is a membrane in between the fingers that make them able to swim fast. The tiger is known to drive hoofed prey into the water, especially if the prey animal is a slow swimmer. Fur changed color to dark green when giving birth. Sumatran tigers are found only on Sumatra island. This big cat can live anywhere, from lowland forests to mountain forests, and lived in many places are not protected. Only about 400 individuals live in nature reserves and national parks, and the rest scattered in other areas of land for farming, there are also approximately 250 tails longer kept in zoos around the world. Sumatran tiger faces threats of habitat loss due to spreading areas such as blocks of lowland forests, peat lands and threatened mountain rain forest clearing for agriculture and commercial plantations, as well as encroachment by logging and road building activities. Due to an increasingly narrow habitat and reduced, then the tiger had entered the area which is closer to humans, and often they are assassinated and arrested for entering rural or lost due to accidental encounters with humans. Sumatran tiger food depends where he lives and how plentiful prey. As the main predators in the food chain, tiger mepertahankan wild prey populations are under control, so the balance between prey and vegetation that they eat can be maintained. They have a sense of hearing and sight are very sharp, which makes it a very efficient hunter. Sumatran tigers are solitary animals, and they hunt at night, patiently stalking their prey before attacking from behind or the side. They eat anything that can be captured, generally boar and deer, and sometimes poultry or fish. Orangutans can also become prey, they rarely spend time on the soil surface, and therefore rarely captured tiger. According to the Sumatran Tiger locals also like to eat durian. Sumatran tigers are also able to swim and climb trees when hunting prey. Sumatran tiger poaching of forest area is not precisely known, but it is estimated that 4-5 adult Sumatran tiger tail require roaming area 100 square kilometers in area of ​​lowlands with optimal numbers of animals (not hunted by humans). Sumatran tigers can breed at any time. The gestation period is about 103 days. Usually the tigress gave birth to two or three tiger cubs at a time, and at most 6 tails. The new cub's eyes open on the tenth day, although the cub at the zoo there is a record born with open eyes. Cub only drink mother's milk during the first 8 weeks. After that they can try solid food, but they still suckle for 5 or 6 months. Cubs first leave the nest at the age of 2 weeks, and learn to hunt at age 6 months. They can hunt alone at age 18 months, and at the age of 2 years cubs can stand alone. Sumatran tigers can live for 15 years in the wild, and 20 years in captivity.